There are increasing number of platforms in the social media landscape where businesses need to “stake their claim,” and engage with consumers. But it can be tough for brands to keep track of their Facebook pages, mentions on Digg, photos on Flickr, Tweets on Twitter and so on. Startup KnowEm is launching a family of services that are designed to help both large companies and small businesses stake their brand claim in social media landscape and manage their presence on these sites. 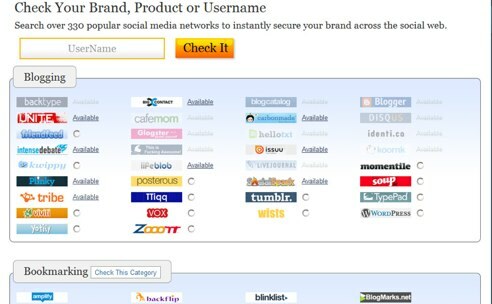 On KnowEm’s site, brand owners can instantly check the availability of their branded usernames and keywords on more than 330 social media networks (for free). KnowEm returns a list of social networks where the brand is and isn’t registered. Brands can then choose to have KnowEm secure company and product brands across networks and will also set up profiles for each company or brand. And companies will have a dashboard on KnowEm where they can access all of their profiles on social media sites from a centralized platform. The dashboard also includes an aggregated feed of mentions of a brand across the social platforms, including Digg, Twitter, and more. KnowEm has several types of services to offer to brands. For a flat fee of $349, KnowEm will create and insert relevant information into profiles on the top 150 social media websites. For $99, KnowEm will create the profiles for the brands but won’t fill out the profiles. Brands can also pay $49 per month to protect a brand or username on emerging social media sites. So if any social media site launches, KnowEm will stake out the brand’s territory automatically. The startup has been offering its services in beta since April, and has been working with an interesting range of clients (whose names cannot be disclosed), including one of the three major search engines (Yahoo, Bing or Google), a large pharmaceutical company and restaurant chains. KnowEm’s services seem to fulfill a genuine need for enterprises, brands and even celebs looking to play in the social media world. As we’ve seen from Twitter username-squatting, this can be a problem for brands and celebs. The pricing seems fairly reasonable and as the importance of brand engagement on social media platforms picks up, KnowEm could find a loyal following.